“Ba-zi” 八字 is considered as the most popular fate analysis technique in modern Chinese Metaphysics. It based on one’s birth time, using the Stems and Branches Recording System 干支記法, to look into his/her characters, appearance, and of course the fate. This fate analysis technique was developed by XU Zi-ping 徐子平 during the Periods of Five Dynasties and Ten Kingdoms 五代十國 (907CE to 979CE). XU was not known in the official history of China but was widely spread across the community of Chinese Metaphysics. Prior to XU, how did people analyze fate? It was called the “Three Life Aspects” 三命論 in which the Branch equivalent of the Year Stem called the Life of Nobility 祿命, the Year Branch called the Life of Self 本命, and the Na-yin Wu-xing 納音五行 of the Year Stem and Branch (the Year Column) called the Life of Spirit 身命. Legend has it that this fate analysis technique was developed by a hermit by the name of Luo-lu-zi 琭琭子 during the Periods of Warring States 戰國時代 (475BCE to 221BCE). He put forward a Rhymed Folk Song called the “Three Life Aspects of Fate” 《三命消息賦》. Obviously, “Three Life Aspects” was almost half a century ahead of “Ba-zi”. XU interpreted the “Three Life Aspects of Fate” based on his newly developed theory of “Ba-zi”, but what makes this rhymed folk song so unique, to the extent that XU had to make his best effort interpreting it? “Interpretations of an Ancient Rhymed Folk Song titled the ‘Three Life Aspects of Fate’ by Luo-lu-zi” put together a collection of interpretations by a few ancient Chinese metaphysicists including XU, giving us a thorough insights of how fate analysis evolved. Covers the introduction of when the book was launched. Includes also a brief comparison of different interpretations. The interpretations deployed concepts of multiple principles covering “Yi-jing”, philosophy (Confucianism, Buddhism, and Daoism), ancient astrology and calendar, Na-yin Wu-xing, etc. Chapter 2 puts forward a brief introduction such that reader can easily understand the poem. Covering detailed interpretations by XU Zi-ping 徐子平, Monk Tan-ying 釋曇瑩 and LI Tong 李仝 of the Song 宋 Dynasty and WANG Ting-guang 王廷光 properly from the Ming 明 Dynasty . 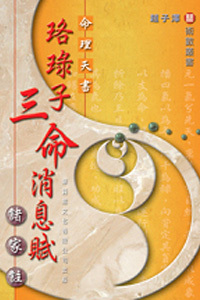 This book is written for people who have a basic knowledge of Ba-zi and wish to learn of how it evolved from ancient fate analysis.